A jewel in the crown of Dijon’s hotels, the Grand Hotel La Cloche Dijon perpetuates with panache the tradition of prestigious establishments. From the first moment of entering the majestic entrance hall, the crystal chandeliers exemplify the hotel’s exclusive luxury. Settled in a historic landmark, the building has for decades symbolized the Burgundian lifestyle. 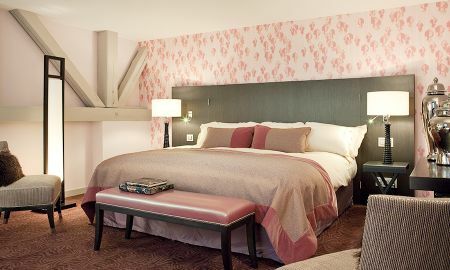 Boasting elegant rooms and suites that balance refined décor with deluxe amenities. The plush furnishings provide the paramount of comfort and a sophisticated style for the 21st-century traveler. Selected accommodation benefit from advantageous inclusions such as a high-end appliances, separate living room and a sofa to relax after an active day. Rise well-rested each morning to fill the void with a nutritious breakfast to kick-start the day. The fully refurbished Les Jardins by La Cloche restaurant offers modern cuisine and great food and wine combinations. Orchestrated by Chef Aurélien Mauny, the gastronomic menu changes with the seasons to show off the best local produce. Sink into a padded red or blue armchair in the cozy hotel bar "Le Bar" and sip an espresso or specialty tea with a fresh pain au chocolat. Light jazz music creates a soothing atmosphere for a tête-à-tête with colleagues or a glass of fine Burgundy wine. The prestigious Napoleon III lounge, with an authentic décor, includes high ceilings, wood floors, and natural light; accommodating all types of events, the lounges are located in La Cloche's pavilion, in the heart of the gardens. The Spa by La Cloche, built under the hotel's ancient stone vaulted ceilings, is an invitation to unwind. For a complete sense of wellbeing, rejuvenate using the relaxation pool, multi-sensory shower, sauna, hammam, fitness room, or treatment cubicles. 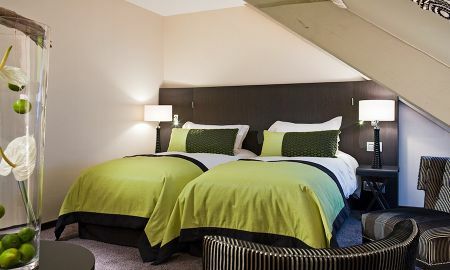 Steps from Jardin Darcy, this traditional hotel is a 4-minute walk from Dijon Cathedral and 8-minutes from the Musée des Beaux-Arts de Dijon.The hotel is only 7 km away from Dijon Bourgogne - Longvic Airport.